BANGI, 11 Oct. 2010 – Universiti Kebangsaan Malaysia (UKM) has signed a memorandum of understanding with Jaring Communications to implement the Cloud Computing and High Performance Computing (CHPC) Programme. 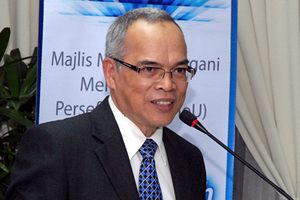 The Director of Centre of Information Technology UKM, Prof Ir. Dr Othman A Karim signed for UKM while Jaring Communications was represented by its Chief Executive Officer, Dr Mohamed bin Awang Lah. Prof Dr Othman hoped UKM researchers will be able to move forward in research exploration and feel free to innovate new products with the enhanced processing ability provided by CHPC. “I’m confident the combination of infrastructure and CHPC technology servers with the expertise and applications built by UKM will help fulfil the government’s vision of enhancing wealth and national values in becoming a developed nation,” said Prof Othman who represented the Vice Chancellor, Tan Sri Dato Dr Sharifah Hapsah Syed Hasan Shahabudin. Cloud Computing, is an important phase in the internet evolution that enabled sources of computing to be provided as a utility service to consumers at any time and place. UKM will benefit from the facilities and save the cost of buying licences, softwares and processes. The researchers involved can also make use of the High Performance Computing in their research. Researchers like Prof Dr Mohd Alauddin Mohd Ali from the Faculty of Engineering and Built Environment is heading a project on Very Large Scale Integration (VLSI) GRID – Integrated Circuit Design For Green Motion Congtroller; Prof. Ir. Dr Shahrir Abdullah also from the same faculty heads a project on Automotive Grid – Fuel Efficient Concept; and Prof Dr Fredolin Tanggang @Tajudin Mahmud from the Science and Technology Faculty who is researching on Climate Grid. Dr Mohamed said the launching of One Grid last April meant that Jaring Communications was ready to market its services based on CHPC. “Through this Memorandum of Understanding Jaring and UKM can move forward in enhancing the usage of OneGrid for our mutual benefit,” said Dr Mohamed.